A promotional products solutions provider in the advertising specialty industry . 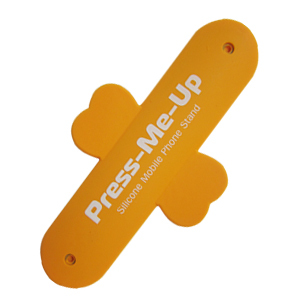 Hottest mobile accessory, simple style but practical, reusable, durable and portable. Made with non-toxic silicone material which is non-slip and soft texture, tear resistance, various colors for selection. Easy to use: Simply peel off the adhesive pads and attach to the back of your phone or case , then press the center and the sides curl up to become a stand for vertical or horizontal use! Straighten out the curled sides to have the Touch-U lie flat again. Widely range of application, great for watching videos, web browsing, viewing photos & hands free calls. Compatible for almost all types of smartphones , such as iPhone ,Samsung , HTC, Huawei, Mi etc. Best affordable giveaways for telecom corporation, mobile company, credit card company. OEM order with customized color and printing are accepted at MOQ 500 pcs. Sign up to receive our new products and Newsletter automatically via email .